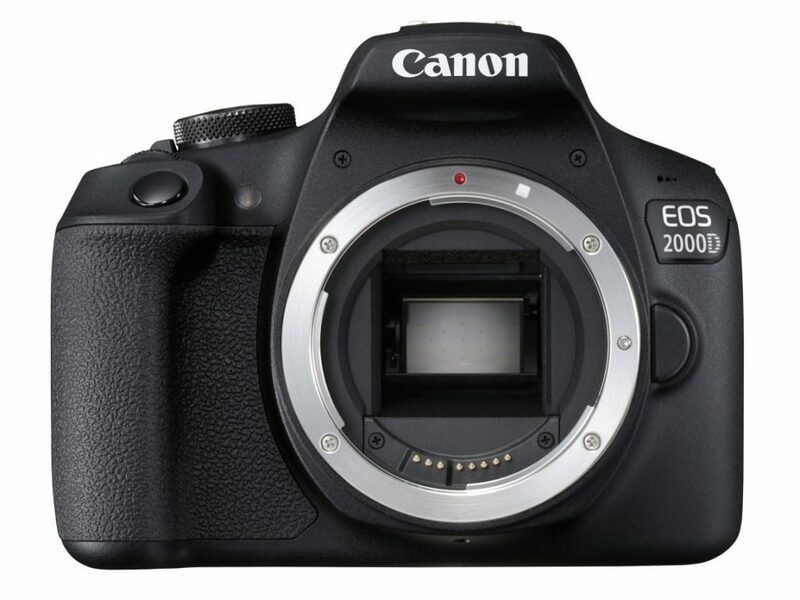 The Canon EOS 2000D was introduced in February 2018 as the replacement for the EOS 1300D. Known as the EOS Rebel T7 in the US, the 2000D is very similar to the camera it replaces (a.k.a. the EOS Rebel T6), but it has a 24Mp sensor in place of the 18Mp device in the older camera. Despite the change of sensor, Canon has used the same DIGIC 4+ processing engine as in the 1300D. The processing engine and larger sensor combine to allow a sensitivity range of ISO 100–6400, expandable to ISO 12,800, and a maximum continuous shooting rate of 3fps (frames per second). Canon hasn’t given the 2000D its Dual Pixel CMOS AF system, however, nor the older Hybrid CMOS AF system, which means it uses contrast detection for autofocusing in Live View and video mode. Built with novice photographers in mind, the 2000D has a built-in features guide, a Scene Intelligent Auto mode, and a collection of scene modes in addition to the more advanced options of aperture priority, shutter priority, and manual exposure mode. We’ve put the Canon 2000D through our industry-standard benchmark tests, and we’ll compare it here with some of its closest competition. The Canon 2000D achieved a reasonably respectable overall score of 71, which makes it one of the best-scoring APS-C format, entry-level DSLRs from Canon. It also pulls a point ahead of both the Canon 760D and the high-end 7D Mark II. Interestingly, while it delivers the best results for Portrait (color depth) and Sports (low-light ISO) at its lowest sensitivity setting (ISO 100), the dynamic range is actually higher at ISO 200 than it is at ISO 100. It’s only a tiny difference, 11.77EV vs 11.85EV — so not even 0.1EV, but we normally see a slight drop between ISO 100 and 200. The low-light score indicates the highest sensitivity (ISO) at which the sensor achieves good image quality. We quantify this as delivering 18-bit color, 9EV dynamic range, and a signal-to-noise ratio over 30 decibels. At ISO 1009, the 2000D’s score is acceptable rather than impressive. As previously mentioned, the 2000D has a 24Mp sensor, which is a 6Mp step up over the 1300D’s sensor. The fact that the newer camera still scores slightly higher across the board than the camera it replaces means that the improvements can be attributed to better sensor design. The 2000D isn’t the first Canon camera to feature a 24Mp sensor, and judging by the scores, it uses the same or very similar sensor to the one used in the 750D, albeit without the phase detection pixels that facilitate the 750D’s Hybrid AF III system in Live View and video mode. 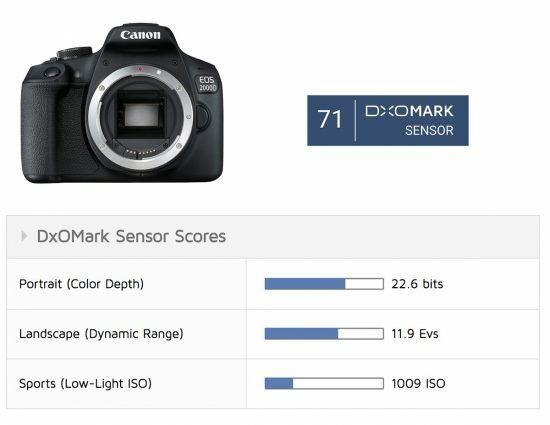 Comparing the 2000D’s test results with those from more recent 24Mp Canon cameras, such as the mirrorless EOS M6 and M100, suggests that the manufacturer has reserved its newer sensors for its more prestigious cameras. Those cameras also have Canon’s DIGIC 7 processing engine, which means that they are able to use more complex noise reduction algorithms in real-world photography. In our tests, the newer sensors benefit the cameras on every front, although in some cases only very marginally. For instance, the M100 offers 1EV greater dynamic range than the 2000D, but only about 0.3EV better low-light capability. The 0.9-bit difference in the color depth (Portrait) score is unlikely to be noticeable, though it may be useful when processing images post-capture. As a DSLR aimed at novice photographers, the Canon 2000D is in direct competition with the Nikon D3400. As the table below shows, the Canon sensor lagged behind the Nikon sensor in our tests. Again, although the numbers look quite dramatically different, the difference in the Sports score is actually quite small, less than one-third of a stop. With a 2-bit difference in the color depth (Portrait) performance, however, it’s possible that you will see better color in images from the Nikon D3400, and they will also be a little more elastic in post-capture processing. The biggest difference, however, is with the dynamic range. The D3400 can record up to 2EV more tone. That will be especially noticeable with high-contrast scenes, for example, in landscape shots and images taken in sunny conditions. The Sony A5100, which dates from August 2014 but is still available, sits in between the Nikon and Canon cameras in terms of performance. However, it offers 0.4EV improvement in low-light (Sports) capability over the 2000D, more than the Nikon sensor. The difference it offers in dynamic range (Landscape) could also make a noticeable impact, as the Canon camera will lose highlights a little quicker. Now we’ll take a look at some of the details of our analysis for a more in-depth understanding of how the Canon EOS 2000D compares with its closest APS-C competition, the Nikon D3400 and the Sony A5100. It’s clear from the graph below that the Canon 2000D falls behind the Nikon D3400 and Sony A5100 at every sensitivity setting. The biggest differences are seen at the low-to-mid sensitivity (ISO) settings, which are also the most commonly used settings. It’s particularly marked at around ISO 400, when the D3400 captures almost 3-bit better color. Looking at the higher end of the sensitivity range, we’d recommend sticking to ISO 1600 or lower with the 2000D, but the Sony A5100 can be pushed 1EV further to ISO 3200 reasonably safely, if color is your primary concern. The D3400 does even better, but ISO 3200 is a sensible maximum. From around ISO 800 upwards, the Canon 2000D’s dynamic range is very similar to that of the Nikon D3400 and the Sony A5100. As you can see from the graph, however, below that value there’s an appreciable difference that increases as sensitivity drops. With a 2-stop difference in the dynamic range at their lower sensitivity settings, Canon 2000D users will see highlights lost and shadows blocking up more quickly than Nikon D3400 users. It’s worth noting here that we measured the D3400’s lowest sensitivity setting as ISO 63, significantly lower than its ISO 100 marked value. Meanwhile, the Canon 2000D’s and the Sony A5100’s measured ISO 100 values are 92 and 76, respectively. This could contribute to the differences in the dynamic range at the lower values; however, even at its ISO 400 setting, which we measured as ISO 259, the D3400 captures a wider range of tones than the 2000D at ISO 100 or 200. While the line for the Canon 2000D in the graph below overlies those for the Nikon D3400 and Sony A5100, the 2000D’s images have slightly more noise at each sensitivity setting. This is explained by looking at the actual measured sensitivity values as well as the specified settings. As mentioned earlier, at ISO 100, the Nikon D3400 has a measured sensitivity of ISO 63. This helps it to achieve the best signal-to-noise ratio overall. That means if you want to capture images with the lowest possible noise, you should opt for the Nikon D3400 and set it to ISO 100. However, with an actual ISO reading of 63, it will require about 0.5EV slower shutter speed than the 2000D. It may very occasionally even need a tripod to get sharp results in some instances when the 2000D can be hand-held. With a measured ISO of 76 at its ISO 100 setting, the Sony A5100 also produces slightly cleaner images than the 2000D at ISO 100 (92). This pattern of the Nikon D3400 and Sony A5100 just beating the Canon 2000D by virtue of their lower (less accurate) sensitivity settings is seen all the way up to ISO 6400. With the exception of its sensor, the specifications of the Canon EOS 2000D are very similar to those of the 1300D that it replaces. That change in sensor brings a step up in image quality; however, the processing plays a major part in image quality these days, and sticking with the DIGIC 4+ processor of the 1300D may hamper the 2000D a little in real-world shooting scenarios. Comparing the results from the 2000D with those from the Canon M6 and M100 suggests that some parts of Canon’s new camera aren’t quite as new as you might think. The more upmarket M6 and M100 sensors produce better results in our tests. They also benefit from using the DIGIC 7 processor, which should help them in real-world shooting as well. The most limiting aspect of the 2000D is its dynamic range, and at low-to-mid sensitivity (ISO) values, it is soundly beaten by its closest competition, the Nikon D3400 from August 2016. Even the Sony A5100, which dates from August 2014, beats it convincingly at its lowest two ISO values. In conclusion, the Canon 1300D has been a good seller and the 2000D improves upon it, but it’s unlikely that a 13000D user would want to upgrade to it. Prospective 2000D owners are unlikely to have any lenses or commitment to Canon, and on the basis of our results, they would be better served by investing in the Nikon D3400. In this review we have compared the Canon EOS 2000D to its most direct rivals that we’ve tested. As usual, you can create your own comparisons and in-depth analyses using our interactive image sensor ranking tool.